Melanie C. Grossman, M.D. (New York) - Book Appointment Online! 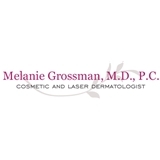 Dr. Melanie Grossman, board-certified dermatologist, has been in practice in New York City for more than 20 years. A co-inventor of laser hair removal, Dr. Grossman is a pioneer in the field of aesthetic dermatology and one of a select group of thought-leaders at the forefront of innovative technology in dermatology today. I believe in personal attention for all of my patients and I dedicate extra time to each visit so they never feel rushed. A relaxed pace is an important part of my integrated approach to skin care that encompasses cosmetic needs within the context of a patient’s lifestyle.. – Dr. Melanie Grossman Freeze your fat off Dr. Grossman was one of the first of a select group of dermatologists offering Coolsculpting®, a revolutionary procedure that uses cold energy to eliminate fatty deposits in hard to treat areas. Melanie is wonderful. A lovely person and a skilled and thoughtful practitioner. I 100% recommend her and the services she provides.